West Ouachita High School hurler Joseph Tassin came through for his Chiefs in this April 2015 game and his coach Mitch Thomas took notice. The senior pitched shutout ball into the fifth inning, helping the club to a win, according to The Monroe News Star. "Joseph (Tassin) bowed up for us again tonight," Thomas told The News Star afterward. "He pitched an inning for us last night. It is what you expect from your seniors and he did that for us." Thomas serves as West Ouachita's head baseball coach and athletic director. He has a history in baseball going back to a six-season pro playing career. West Ouachita High is just outside Monroe, La., the hometown of the former Rangers farmhand. Thomas' baseball career began in 1985, taken by the Rangers in the eighth round of the draft out of the University of Louisiana at Monroe. Thomas began his playing career in the rookie Gulf Coast League and at single-A Salem. He went 7-2 between them, with a 2.08 ERA. He returned to Salem for all of 1986, posting a 3.89 ERA over 22 starts, but amassing a 3-12 record. He then moved to single-A Charlotte for 1987, helping pitch a shutout in a July game. He went 6-9 on the season. 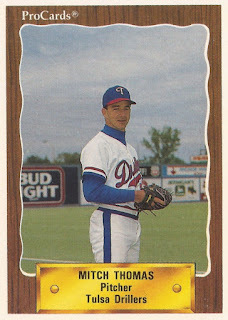 Thomas arrived at AA Tulsa for 1988, where he would stay for the rest of his career. He went 6-7m with a 4.35 ERA in 1988, then got into a single game there in 1989. Arm issues helped limit him to that one outing. Thomas returned to the field and Tulsa for 1990. In eight starts, he went 2-3, with a 3.35 ERA, ending his career. Thomas then returned home to Monroe, serving as athletic director and coach at West Ouachita High in 2015.